Property titles are essential to any real estate transaction for a number of reasons. 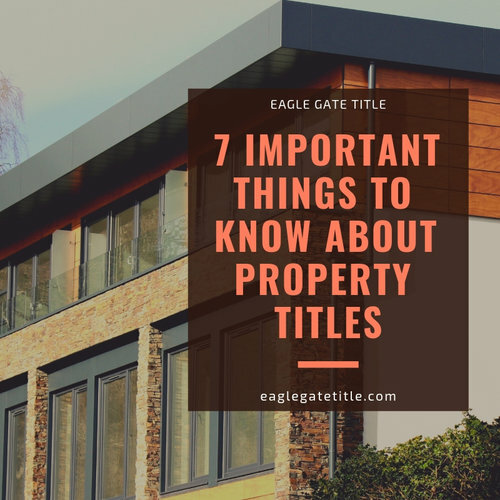 Here are 7 things about St George property titles that you should know. St George property titles act as records of ownership. Informal contracts or deeds that haven’t been filed won’t be recognized without a title. Those who own property should not be careless with their title documents. Yes, you can get another copy of your title by paying a fee to the county clerk’s office. But St George property titles should be cared for and protected the same way you would your social security card. Keep them in place where they are safeguarded but where they can be easily accessed. Each person listed on the title as having ownership in the property should have their own valid and legal copy of the title. A Xeroxed copy is not valid. All copies of St George property titles distributed amongst owners should be actual copies, whether the situation involves tenancy in common, community property, trust-based ownership, or company-based ownership. There are many reasons why a person would conduct a search on St George property titles, including and potentially even yours. Visit this link for detailed information on title searches. Lender’s insurance and owner’s insurance are both mandatory. It is recommended in almost every circumstance that both types be purchased by new property owners. Title insurance is invaluable in a wide variety of potential situations. Visit this link for further information on title insurance for St George property titles. In many countries other than the U.S. (such as Australia), they use a system of title governance called a Torrens title system that bestows indisputable and absolute ownership of the property to those listed on the property title. In America though, each state handles their own property and estate governance as they see fit. Most states determine property ownership and rights by using title governance based on common law, though there are some states that incorporate elements of the Torrens title system. In order to gather facts about St George property titles, recorded covenants, and land ownership, you can visit the local courthouse in person, utilize an internet database, contact a real estate agent, or contact an attorney. Using some or all of these avenues should get you the information you’re looking for. St George property titles are incredibly important in any real estate transaction. Find out as much as you can about a property’s title before purchasing. Failure to take proper diligence toward the title can result in a very risky real estate transaction. As always, for further information about property titles, contact Eagle Gate Title.